Lately, baking has been my go-to hobby. It really should be exercising, but nope, baking has been keeping me sane for the past 7 months. During those months, on top of making cookies and cakes for some of the locals, Dad’s mobility was going downhill, and most of my free time was spent with him, which was putting a strain on my family/work life. My brother lives 4 hours away, and all this going down while school was in session was tough on him too. That’s when we scrambled to get Dad into a nursing home. Things went from great, to okay, to kinda okay, to not so okay, and then okay again. So in between my work life and family life, keeping up with Dad’s bills as well as my own, selling his car and trying to figure out a plan to clean out his house (Breathe, Lori, breathe! 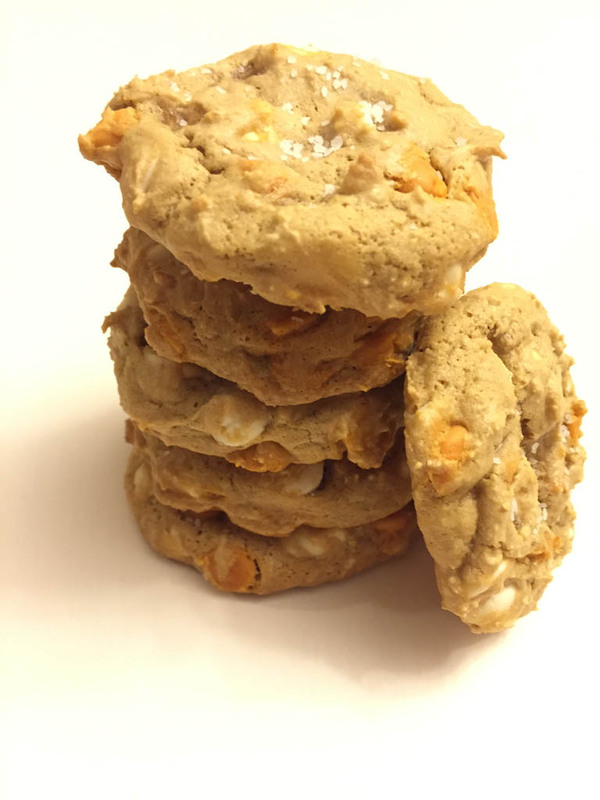 ), I somehow managed to find wiggle room to bake these fantastic cookies, three times!! On a grocery shopping trip shortly after Easter, I found packs of salted caramel morsels. 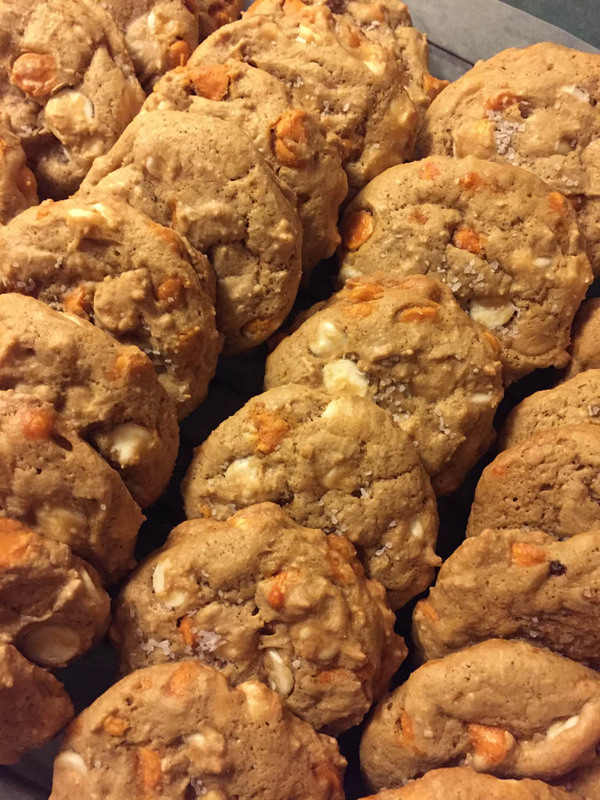 I picked up a bag, thinking they were to be added into the leftover Easter candy cookies, but instead, along with a bag of white chocolate morsels, they ended up in these cookies. I used the same recipe from the chocolate chip cookies. In fact, I use it as a base recipe when I want to use different morsels and toppings. Same goes for the Easter cookies! The labeling says they’re salted, but they’re not too salty. Thanks to my mother, I never add salt to any of my desserts (she was all about watching the sodium! ), but this is a first for me. 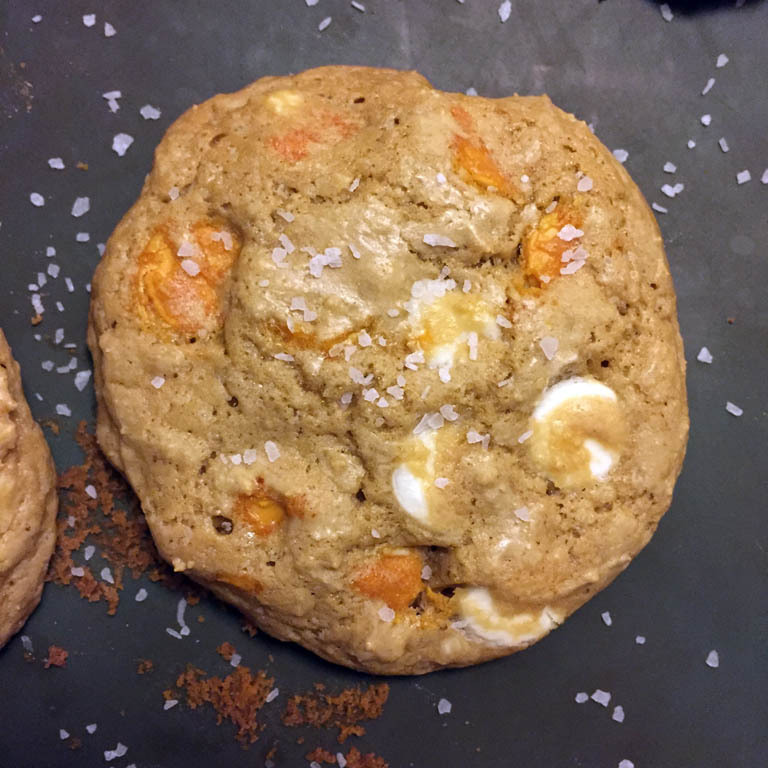 After the first dozen were baked I decided to test something out: I grabbed the box of kosher salt, poured some in a small mug, and sprinkled a little bit onto the cookies, then let them cool. The salt adheres to the cookies the moment they come out of the oven before transferring them to the cooling racks. After they cooled, I tried one, and it changed my life! I’m going to sprinkle salt on all my cookies now (sorry, Mom)!! Maybe not all of them, but these ones are by far my favorite! The sweet ‘n salty taste is the best, especially after a stressful day or night! • Preheat oven to 350-degrees. 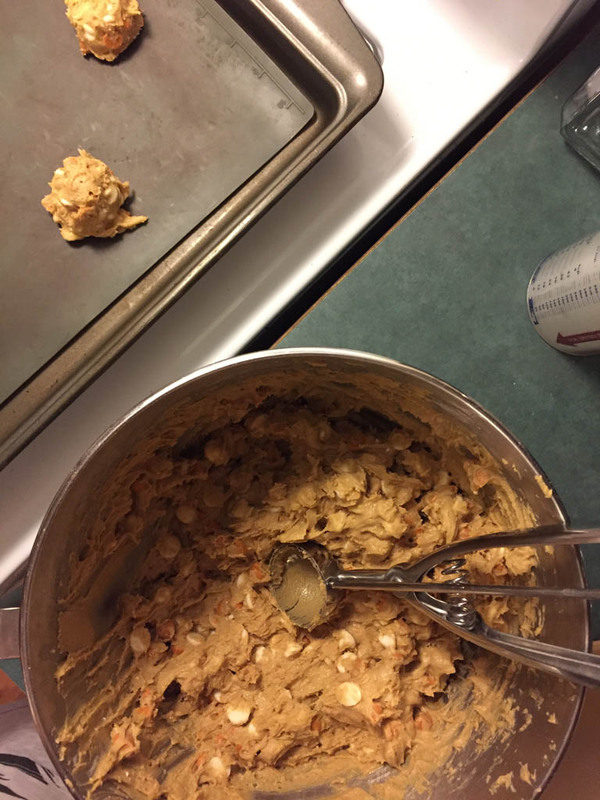 • In a large bowl, mix together the flour and baking soda; set aside. • In a mixing bowl with paddle attachment, mix well the margarine and sugars together. Then add eggs and vanilla extract; blend well. • Gradually fold in the flour mixture until ingredients are mixed well. Add morsels. 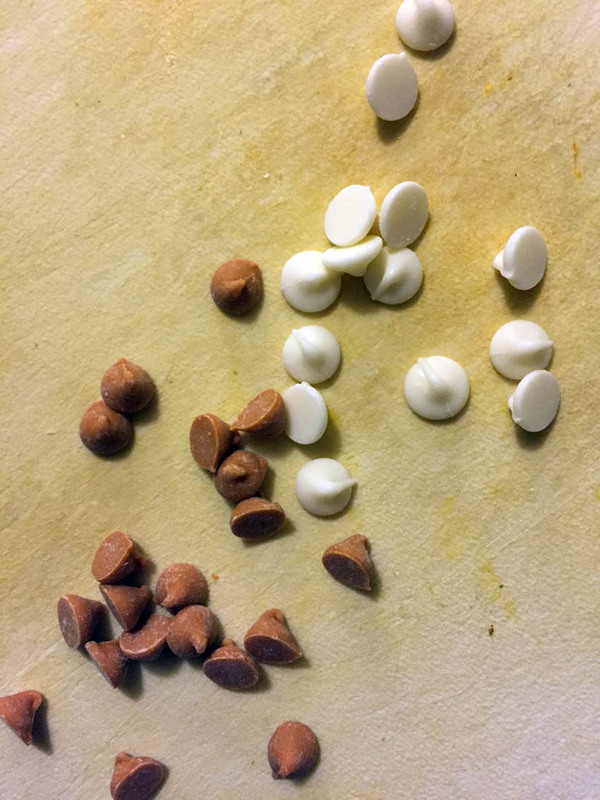 • Drop by tablespoonfuls onto a baking sheet lined with parchment paper or with a silicone mat. Bake for 10-13 minutes until a light golden brown, depending on the size of your cookies. 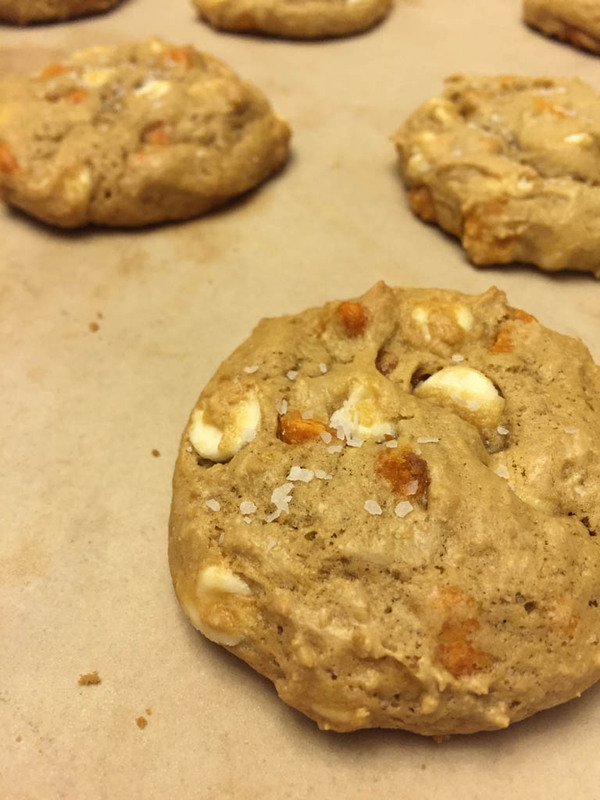 • When baked, remove from oven and immediately sprinkle each cookie with a little bit of kosher salt. Transfer cookies onto a wire rack to cool completely.